Sherman Oaks Remodel goes from 700 sq feet to over 2000 ! 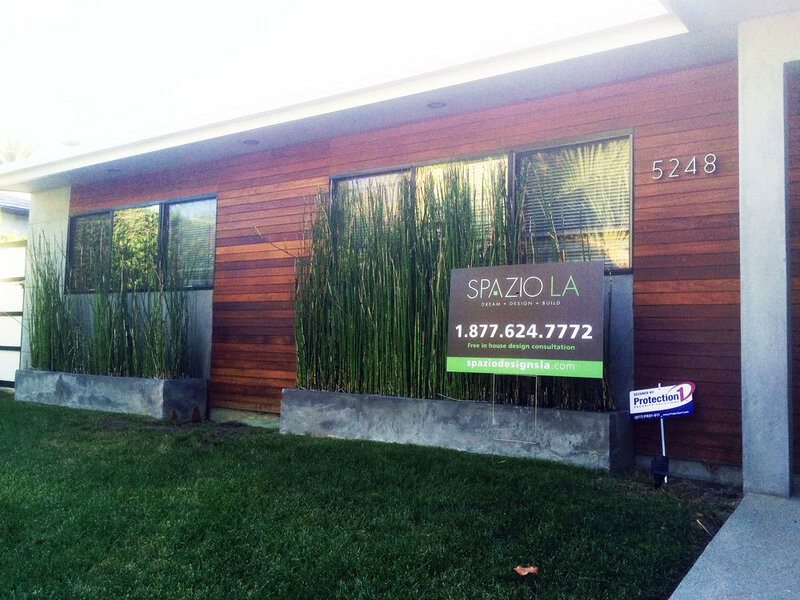 This Sherman Oaks home is a great way to display the love and passion we have for what we do here at Spazio LA. We were able to build a home of our client’s dreams as well as bring our creative expertise to another level. After 7 months of hard work and over 1300sq feet added on to this beautiful home, we are proud to go ahead and share all details with you. 750sq feet before – 2150sq feet after: Smooth grey stucco, Brazilian Ipe siding, modern metal and glass gates and beautiful landscaping makes for this gorgeous house front. Can you say major curb appeal right off the back? I think we can be safe to say that this makes you want to come on in and see what’s on the inside. Let’s get started with all the great details that made this remodel whole. This beautiful master bedroom has lots of natural light thanks to the use of the world famous NANA wall (retractable glass door panels, we have a great blog about them and how to get your own) as well as the 14 foot vaulted ceilings. The NANA walls open up to the IPE deck and patio area. Some will argue that the NANA walls make this room feel so huge, some will argue that the incredibly tall ceilings make this room feel huge – but we will tell you that the combination of the two make for one amazing sight to see. The art work on the walls are all original pieces, and the bed frame was designed and fabricated specifically for the client. We will always go above and beyond to make sure our client is entirely happy with their space. The beautiful kid’s room has zebra hardwood floors, a custom aluminum and glass doored closet, and a custom blue ocean chalk wall mural. This room was designed for a younger child – but the design can most certainly grow with your child or become an office later on when they fly the nest. Our design for the sunken living room was to and depth and dimension, maybe even bring in some drama. This open floor plan needed a little change in level, so we sunk the living room and opened it up with more 11ft NANA walls. This makes for the perfect indoor/outdoor experience, just open the glass walls to bring the life to the party. An open concept design and polished concrete floors, Spazio LA was able to achieve a loft feel in this large home. Concrete flooring throughout the kitchen, island with seating – plus room for a dining table, are just a start to this great kitchen. This contemporary kitchen shows off master chef appliances and became an entertainer’s delight. This bathroom design incorporates concrete onto the walls with a beautiful green color pallet and black slate tile on the floors. The shower has large Italian porcelain tiles complemented by a Brazilian teak wood floor. For those of you whom don’t know much about Brazilian Teak Wood it is durable, and will not absorb water – which makes it good for showers or saunas as it will never rot. We spent a lot of time on this project from the design to the build, but we are very proud to share this with you. Spazio LA hopes to inspire you to believe that your home can be just as beautiful as you dream it to be.